I think chocolate should be worked into meals other than dessert, n’est-ce pas? I could especially use more chocolate tonight, because I just got home from therapy. Other people who go to therapy: you know how sometimes it’s really helpful, and sometimes it’s like you’re paying money to talk to a friend and you wonder why you bother, and sometimes talking about your problems is just kinda depressing and you leave feeling kinda crappy? Yeah, that last one. Ergo: chocolate. So I decided to take cocoa and give some good ol’ red meat a rubdown. 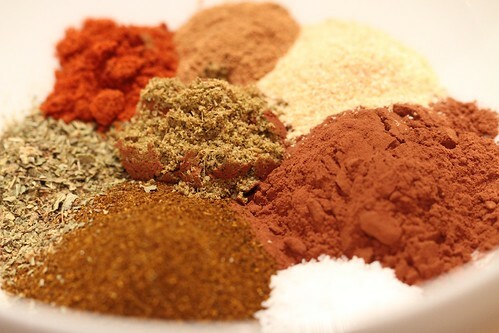 I added in some pasilla chile, cumin, cinnamon, paprika, garlic, oregano and salt. 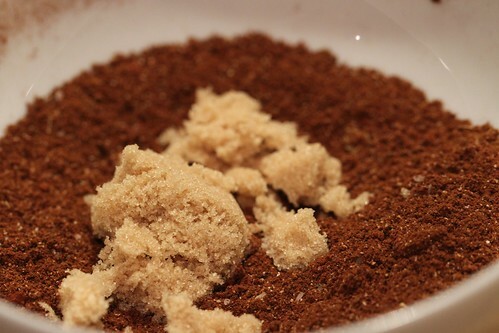 When I tasted it, I realized it needed something to take some of the bitter edge off the cocoa powder, so I whisked in a little light brown sugar. I’m all for having a bitter edge, just not as part of my dinner. Two strip steaks got a spicy patdown and got left to sit for a little while while I took a short nap. Hooray for marinating! Sometimes, I think I’d like to trade therapy for a good nap. It’s cheaper and more refreshing. I don’t know if that means I over-value naps, or under-value therapy. 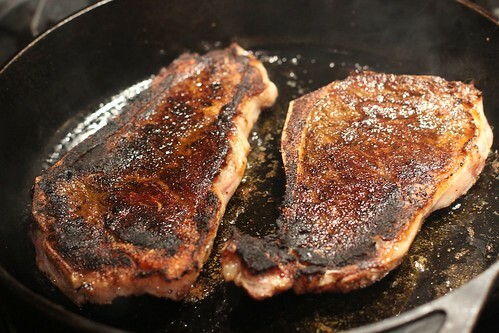 I heated a cast iron skillet to the smoke point and threw in my steaks; because of the sugar in the dry rub, they were quick to caramelize and get nice and brown. Kinda like me: crusty and filled with saturated fats. A wonderfully charred exterior, a perfectly pink interior, and a rich-tasting spice rub with just a hint of heat: this was a good steak. 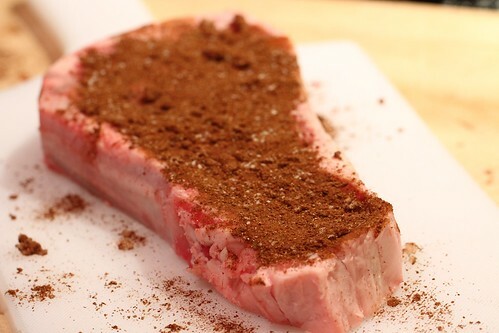 I think the rub would also be great on a pork loin or shoulder. Of course, thanks to therapy, I still had to eat a bar of Green & Black’s milk chocolate with toffee, but that doesn’t indicate a shortcoming in this dinner. H’mmm. And if you did that on a pork shoulder roast, and then braised it in strong coffee diluted with stock…..
Pondering that for the weekend. dang, too bad bran gets a migraine from chocolate. i’ll put the rest of the rub together though. looks delicious. therapy is a double edged sword. i’d never say i had a “good session” i’d say i had a “productive session” for which bran would say “i’m so sorry” and make me supper. Fantastic rub…I could see how it could be a cure for the post shrink blues. That looks amazing. I’ve always been a firm believer of cocoa in savory dishes, as well as sweet. kay, are you also pondering inviting me over for dinner? naomi, a migraine from chocolate? the horror! lora, yeah, it totally worked. crystal, thanks! 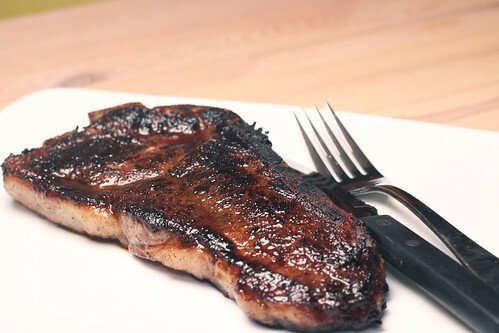 it certainly did produce a good-looking piece of meat. I need to make this. Seriously. I need more cocoa in my life and could always use some spicy steak. This dish is the best of both worlds.